Not all damage is lethal. If the Auto-Healing setting is toggled on, then damage will automatically start to (slowly) regenerate up to 70%. In either case, health can be renewed by visiting and using a Medical Room, which will also act as your respawn point should you perish. When dying and respawning in a Medical Room, there are currently no repercussions except for the loss of any items in that Engineer's inventory, which can be retrieved by finding your engineers backpack (or body if still present) and looting it. If there is no Medical Room present that can be used, engineers have the option of respawning in or out of a respawn ship a good distance away from the point of death and travelling back to reclaim their things. Permanent Death (if enabled) is the loss of control of blocks under the Ownership of the player. This occurs when the player dies and has no Medical Room in which to spawn at. Blocks that you lose Ownership of will treat you as hostile. The Space Suit protects the wearer from the harsh environments in Planets and space. It regulates its own energy supply, contains its own Oxygen supply, Hydrogen fuel for the jetpack, and a built-in Antenna with a range of 200m. It has no means of defense against Weapons, therefore the wearer is quite vulnerable to weapons fire of any sort. The Jetpack is what allows the engineer to free-roam in space & Planets. It allows for easier construction, maneuvering in environments with no Gravity, climbing and breaking falls. Without it, players have no means of movement in non-gravity environments and are doomed till they run out of resources in their space suit. The space suit jetpack also comes with a built-in Inertial Dampeners, which passively allow the engineer to automatically stabilize their position, or slow down. In Survival Mode the concept of suit energy represents the limited-capacity battery included in every space suit. Your suit's life support system slowly drains the suit's battery passively, whether or not you are actively using any of your suits systems or Tools. When at 25% energy, a voice and visual prompt will appear on the screen warning you of low energy. The energy indicator will turn red at 5% or lower, and another audio/text warning will remind you you are at critical energy levels. At 3% energy, you will not be able to use your jetpack. 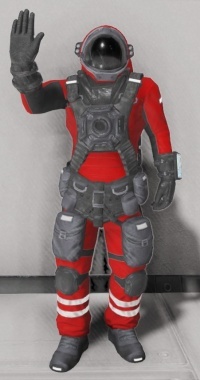 If your energy is ever depleted, your character will slowly asphyxiate as you're unable to pump Oxygen in your suit, resulting in death if energy is not replenished immediately. Energy can also be replenished at a Medical Room, and will also be filled while sitting in a Cockpit, Fighter Cockpit, Control Station, Flight Seat or Passenger Seat, if the grid (ship) it is on is powered. The space suit has an internal Oxygen tank to supply the player with breathable O2. While the player wears his or her helmet, the suits oxygen tank provides O2 to the player. The remaining oxygen capacity is displayed in the left status panel of the players HUD in [%] values. Oxygen supply in the suit can be replenished from Cryo Chambers, Cockpits, and Medical Rooms if they're directly connected to an Oxygen Tanks or an Oxygen Generator. Oxygen can also be replenished on the go from Oxygen Bottles, which will refill the suit when below 40%. The space suit's jetpack requires Hydrogen in order to fly around. The remaining hydrogen supply is displayed in the left status panel. The player can regain hydrogen supply by either using a Medical Room that is attached to a Hydrogen Tank, or with a Hydrogen Bottle in their inventory. The effectiveness of the jetpack changes depending if the player flies in space, in an artifical gravity field or on a Planet/Moon with Natural Gravity. While in natural gravity, the lifespan of the hydrogen is heavily reduced. In addition, the stronger the local gravity is; such when mutliple Gravity Generators overlap. The more fuel the suit will consume in maneuvering about within this field. Energy is not limited to just being managed within an Engineer's suit in Survival. All Blocks with any sort of active function, including the Refinery, Assembler, and others, require power to operate. Even Conveyor blocks require power in order to function (see Conveyor Mechanics). Powered blocks need sources of Power such as Solar Panels or Uranium based Small Reactors and Large Reactors. An important mechanic to note is that only Thrusters and Batteries will scale their performance based on the available power. (they can operate at less than full potential.) A Refinery or Assembler will not function when there is not enough power available. Uranium powered reactors have the largest output in the game, far exceeding alternatives such as Solar Panels or even Batteries. They are fairly expensive to build and to operate. Reactors require fuel in Survival Mode. The fuel source needed is Uranium Ingots, which is processed from Uranium Ore. Uranium consumption is based on the reactor's output and efficiency. The ore can sometimes be difficult to locate on Asteroids or Planets/Moons. Small Reactors are capable of powering systems that require a lot of power. However as more Thrusters and blocks such as Refinerys or Assemblers are added, it quickly will be overloaded. The player can add more reactors, or build the more powerful and efficient Large Reactor. The Large Reactors have 20x the output of a Small Reactor, but the Components required to build them is very expensive up front. That being said, once built, they are capable of powering large amounts of powered blocks, and several Large Thrusters. Space wise, it is far better to build one large reactor, than several small ones for the same amount of output. Solar Panels are capable of generating power from direct exposure to the sun. While not able to output as much power as Small Reactors, they are a source of infinite power without any consumption of resources, except for the building of the solar panel itself. Blocks with high power consumption such as Assemblers cannot be supported by a single solar panel with low demand on power such as Medical Rooms. When used in conjunction with Batteries, they are more than capable of rivaling uranium powered reactors on a small scale. 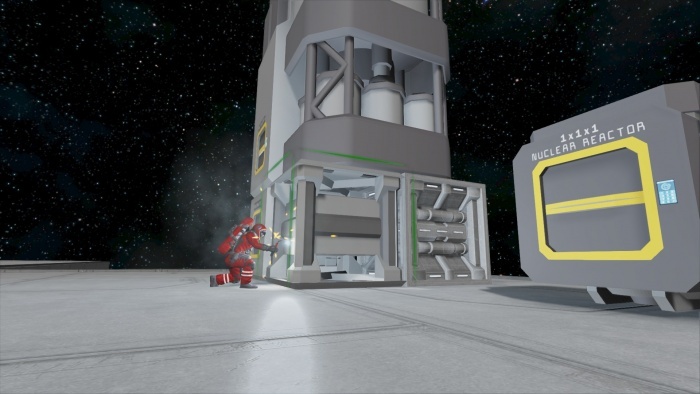 In Survival Mode Cargo Containers, and other blocks with an inventory have a capacity, this also includes the engineer (player) as well Inventory capacity can be modified in the World Settings of the world. Each item in the game has a set amount of space they take up when in an inventory. It should be noted, that as more Components, Materials, Ore, etc you store on your ship, the heavier and less maneuverable it will become. See Thrusters for more information. In Survival Mode, all blocks must be constructed in stages before they are in a finished build state. Blocks are made up of Components, which can be piled into the block to slowly constructed into its completed stage with either a Hand Welder Ship Welder. Welding speed can be modified in the World Settings. Blocks can alternatively be salvaged for their materials using a Hand Grinder or Ship Grinder. As the block is being deconstructed, their Components are placed in the engineers or ships inventories. Almost all blocks will return all of the same components needed for its construction. The exception for this is the Battery block. Grinding speeds can be modified in the World Settings. This page was last modified on 9 July 2018, at 19:53.